The ABL80 FLEX CO-OX blood gas analyzer provides blood gas, electrolytes, glucose and CO-oximetry parameters with all the advantages of a compact system, including simplicity and reliability. Automatic quality control ensures reliability of testing performed at the point of care and documents regulatory compliance. The ABL80 FLEX CO-OX analyzer comes with a variety of parameter panels and rapid start-up time after change of consumables. On top, it features customizable interface profiles and centralized user management, providing high flexibility to both laboratory and clinical staff. 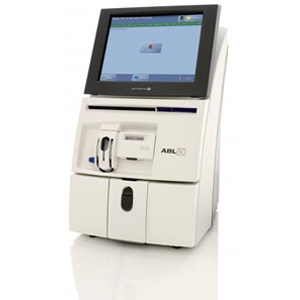 The ABL80 FLEX CO-OX analyzer offers full IT connectivity to the AQURE point-of-care management system*), and can be used as a part of Radiometer’s 1st Automatic solution.